Houston Mayor Sylvester Turner has placed an item on next week's council agenda to hire lawyers to fight the potential passage of pay parity for firefighters. Wayne Dolcefino continues to bird-dog Houston Mayor Sylvester Turner. This one was so bizarre that I didn’t believe it. I should have. 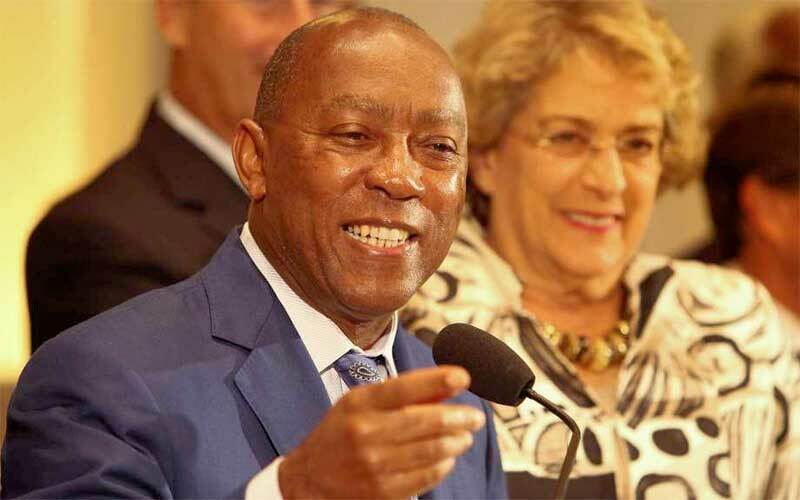 Mayor Sylvester Turner doesn’t have time for this whole democracy thing. We haven’t even voted yet on the Fair Pay for Firefighter Proposition B thing yet, and the Mayor already has an item on the November 7th council agenda to hire lawyers to possibly sue over it. Guess he suspects it will pass? Guess he also doesn’t care about the will of Houstonians? Turner wants Houston City Council to authorize up to $1.3 million dollars for the law firm that would sue to overturn the will of the voters if you disappoint the Mayor. Oh. Did we mention the firm is Norton Rose Fulbright? Maybe you didn’t notice, that the treasurer of the Anti-firefighter PAC Protect Houston is Neil Thomas, who is a Partner in the Law Firm. The Protect Houston PAC was advertised as a group of bipartisan folks, but when you look at the money, about a third comes from the Mayor’s political campaign, and a bunch more from the Mayor’s downtown business buddies and from Houston cops, who apparently think they are bigger heroes than firefighters or work harder or something like that. “I suppose the Mayor would say he’s just being proactive, but at some point, this petty vindictiveness nonsense must stop,” says Wayne Dolcefino, President of Dolcefino Consulting. The Mayor has spent the better part of the last year trying to deny firefighters their pay in the ballot box, and now that they won the right to have you vote the Mayor doesn’t seem satisfied with the notion that you are smart enough to decide what you want to do. The Mayor hasn’t taken us up on our offer to help the City find ways to cut unnecessary spending ABSOLUTELY FREE. Maybe he’s been too busy getting his City Hall lawyers to keep public records a secret or getting mad at reporters for daring to question disaster contracts. Dolcefino Consulting has now asked to see records detailing the $7 million-dollar legal deal his former law partner Barry Barnes just got in a hurricane disaster relief contract. Hard to believe, right? So I went to the City of Houston’s Council website and found the agenda item. Sure ’nuff, Dolcefino is right. An ordinance approving and authorizing a professional services agreement between Norton Rose Fulbright US LLP and the City of Houston; and providing a maximum contract amount. The City is seeking a contract in an amount not to exceed$1,340,000.00for professional legal services with the firm of Norton Rose Fulbright US LLP (the “Firm”) to represent the City if there is litigation regarding the potential passage of the Pay Parity Charter Amendment appearing as Proposition B on the ballot in November 2018. Complete and utter disregard for the will of the voters. Most corrupt administration in the history of the City of Houston? You decide. If you are sick and tired of this corrupt administration. click over to the Bill King Blog and sign up for his email list. He needs moderates and conservatives to come together next year to defeat this corrupt mayor and bring integrity back to City Hall. I am a firefighter, ive written this site before and they have been gracious enough to publish. 2) how does anyone conservative support circumventing the will of the people? Turner is a sociopath who needs major pyschiatric help. Anyone who cares about this city needs to get behind Bill King. Since I don’t actually live in the City of Houston, I don’t really have a dog in this fight. But figuring out which side to vote for is pretty easy – just look at the people taking the “against” position and you’ll figure it out pretty quick. I just hope that pretty soon the Houston voters will figure things out and start voting for mayors with integrity. Otherwise I’m going to end up living next to a dung heap like liberals have already made of cities like Detroit and Chicago. Looks have nothing to do with it. Unless.. you know.. you’re a raging ignorant racist. “Just examine and evaluate the politics, and track record of the people involved and you’ll figure it out pretty soon. Hopefully that will make it pellucidly clear. Mayor Turner is a selfish money hungry psycho who does not care about the citizens of Houston…A typical democrat he wants to screw everyone around and not pay the firefighters what they deserve!! We will never forget the Southwest Inn fire tragedy and the lives lost…How dare he? Yes I will vote for Busby in 2019 a real leader! Mayor Turner is a selfish, greedy and self serving psychopath who is only interested in what he wants and not for the best for the people pf Houston! He lies and stutters his way through speeches and press conferences…We will never forget the horrendous fire at the Southwest Inn and the tragedy of the lives lost…He is out for himself and his family and not we the people…I voted for Prop B and will vote for Mr Busby in 2019! As a small business owner, I side with the Greater Houston Partnership on the Prop B issue. That happens to be the same side as Turner but hey, even a broken clock is right twice a day. Does Prop B provide revenue to pay for itself? No it does not. Does Prop B guarantee the city will keep the same number of public safety workers? No, in fact just the opposite is likely to happen. Is Prop B a fiscally conservative measure that benefits taxpayers who live inside the city of Houston? No, it benefits a bunch of union employees that have endorsed liberal candidates like Turner for years, always looking for more compensation and to protect their unsustainable pensions. Bill King points out that firemen retire with pensions averaging $73 grand a year, medical coverage, and giant sums of money on top of the other benefits, many getting over a million dollars when they leave. Bill further points out that even after last year’s changes, their pensions are still unsustainable yet they have made it clear that they will fight to the bitter end against any needed changes. Bill wants their support and can’t resist taking another well deserved jab at the mayor but ultimately, are they really going to support someone whose long time obsession has been reducing their pensions? Regular readers here can’t be that naive, can they? As far as the legal preparation is concerned, not a single person in the legal community I’ve talked to has ever suggested that the matter would end on election day. Every single one of them said this would end up in the courts for years, some even claiming the whole Prop B experience was just a pressure tactic by the union to force the city to give them 20% or better raises and then forever hold over the head of future mayors. I’m no legal expert and I bear Turner no specific grudge like Mr. King and Mr. Dolcefino surely do toward the man but the bottom line is passing Prop B just adds to the costs of the city while virtually insuring less help will be there when needed. That’s a no win situation no matter how sleazy some of the tactics both sides have used might be. Vote no on Prop B. If there are firefighters getting 73k pensions a year then they are Chief officers. I retired at E/O rank and only get 36k a year after taxes and insurance. HFD generates over 100 million dollars a year…there is your revenue stream. Self fund their own raise. As soon as we deduct the cost of providing those services, meaning your existing salaries, ambulances, trucks, training, and the rest, then you can apply any imaginary profit towards your raises. It would be a bad idea to let officers get a cut from their ticket writing activities and it would be just as bad to encourage fire fighters to gain based on the services they are required to provide. I concur with Mr. Bryan. I Hope they Don’t invite that Idiot mayor to speak at the Houston Fallen Firefighters Memorial Service again. I don’t live in Houston, but I lost my son there. That guy is a Disgrace to the office. As far as the Greater Houston Partnership is concerned has there ever been an issue in the History of Houston in which they were not with the Mayor? Whoever that Mayor may be? According to Bill King, the firefighters have had an 11% pay cut since 2011, and lag behind police by 20% in wages. They opted for a better funded pension over the last several years, while the police traded a well funded pension for pay raises. They make a lot less than firefighters in other major cities; if we want Houston to keep our firefighters, we need to pay them a comparable wage at least. Also, the life expectancy of firefighters is not as long as your average person because of the chemicals they are exposed to when fighting these fires over a lifetime. They tend to have more serious health issues. Our city wastes so much money elsewhere, they can afford to cut back in other areas. They should have campaigned to remove the revenue cap before tilting at this windmill. They had better plan on campaigning to remove the revenue cap in the city election. I have never seen such a jingoistic, non-fact-based, and irresponsible referendum. AND the firefighters’ conservative supporters should be ashamed of themselves. Once again – when you see who’s voting against (and campaigning against) this proposition – like Pat, it ought to give you a good feeling when you vote for it!